Dungeon Crawling 2: Open the Caves! The bursary I received from a-n was for experimenting with bringing ideas around game-journeying and space-making into my practice, particularly through learning how to render a digital space in 3D. In my last blog post I wrote about the research I have done looking at the development in games from tabletop RPGs to text-based adventure games, which then developed into dungeon crawls made with early computer graphics. Although the aim of my bursary is to gain skills that would enable me to make a playable space akin to what we are used to seeing in computer games today (if a lot cruder! ), before doing this I first had to map out a storyline or make some sort of physical plan. 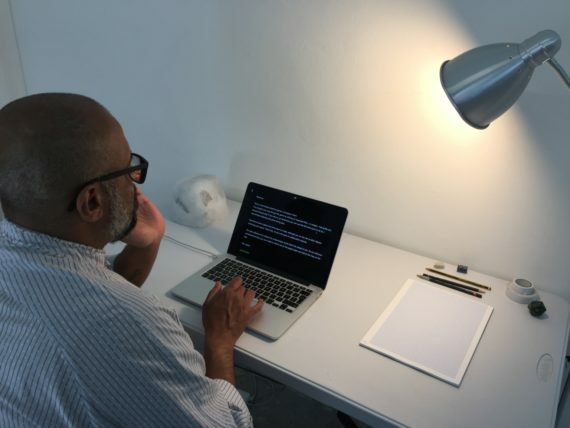 Using the format of a text-based adventure game as a first draft and as a way to organise my thoughts seemed like a good idea and I decided to use a mini residency at LIMBO in Margate to learn how to do this. This required some testing and trialling on my part, mostly with the help of online tutorials. The residency lasted for four days with a small exhibition at the end, meaning it was a pretty intense week! I used the time to think about how to map out game spaces in different ways, with the main outcome being a text-based adventure game that players could play on a computer that was set up in the space. 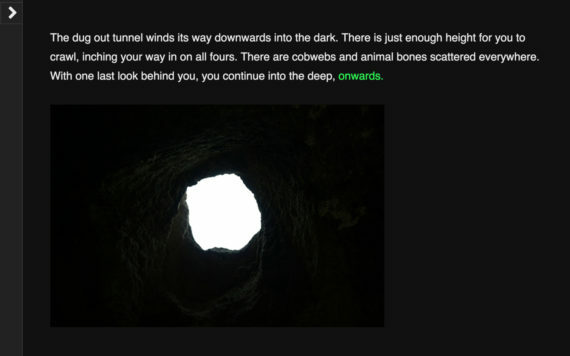 To make the game I taught myself how to use a free software programme called Twine and although this is technically a hypertext game rather than a text-based adventure game – the difference being that as a player you click through links of pre-written text rather than type in commands – it follows much of the same logic. Another word for this format is Interactive Fiction, its similarities mirroring the Choose Your Own Adventure Game style books. 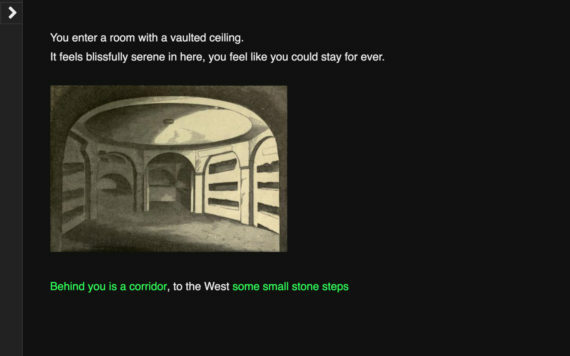 As with the books, with Twine you can use text and images, as well as sound, to guide the player through a journey. The structure of this journey is linear but branches out as soon as you include multiple choices for the player to choose from (see graphic). It also automatically ushers you ‘onwards’ through the story unless you build loops into the game architecture, like linking choices the player makes back to already explored rooms. You can also use conditional logic, meaning as an example, that if a player finds a key earlier in the game they can use that key to open a door later on. Thinking about these limitations were an interesting way to go about constructing a story. Not only did I have to create a directional and spatial confine that was open enough for the player to believe and imagine themselves in but I also had to plan out the journey in terms of the time it might take to play the game. A total space/time conundrum! The game essentially became a labyrinthian structure of possible story lines, as regardless of which route the players take, big parts of the space would likely remain unexplored in each game played. As a small homage to Willie Crowthers’ use of Mammoth Caves as the basis for Colossal Cave Adventure (which I write about in my first blog post), I decided to base my game map on a more local underground space. 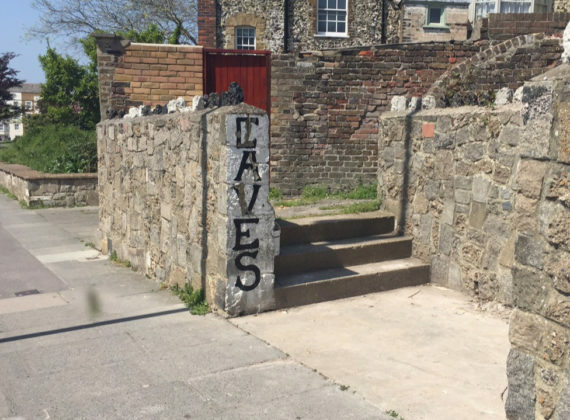 Margate is home to a famous Shell Grotto, but it is less well known that it is also the home to Margate Caves, originally dug out as chalk mines in the 17th and 18th centuries. They later acquired the name Vortigern’s Caves (after a local king) and were a visitor attraction complete with paintings of mythical creatures and hunting scenes on the walls. The caves were closed to the public in the early 2000s, giving them now an almost mythical wiff of potentiality as a space. 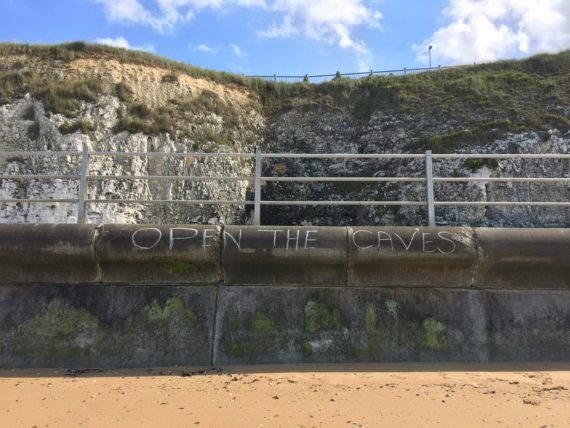 A walk along the beach in Margate earlier this summer revealed much local enthusiasm for the caves to reopen and judging from the building works it is finally looking like this might happen next year. 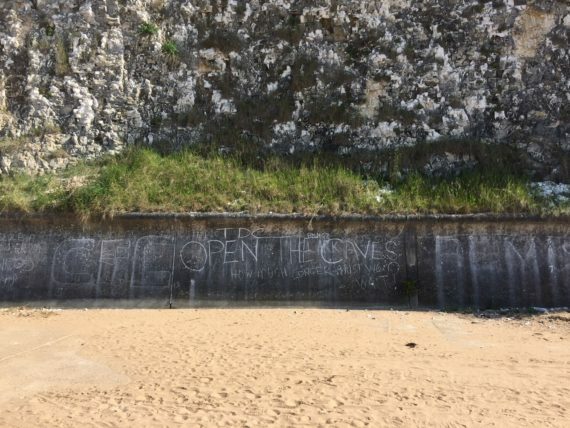 While I was thinking about subterranean fiction, a sub-genre of fantastical literature that has close links to Hollow Earth theory, I was also wondering how such fantastical tales could be brought into the at times dreary realism of a seaside town like Margate. 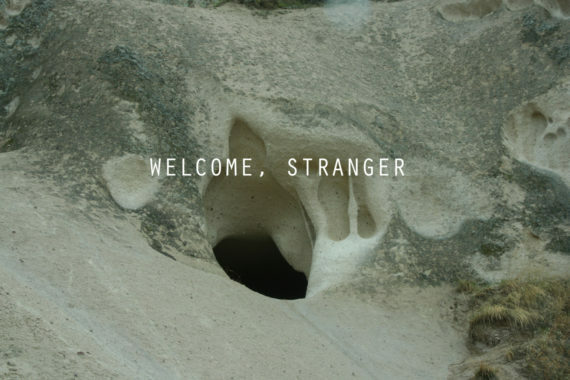 I was thinking of caves as places of both practical, philosophical and imaginary usage, as places for illicit activity or refuge and as places representing both fear and possibility. There are so many roads you could go down when exploring the subterranean, so how was I going to decide on a narrative out of all of this? Then, thinking back to Willie Crowthers’ involvement in ARPAnet and the historical link between cave systems and databases, I decided to use my personal database to advance the story line, as a way of making a method in the face of these endless possibilities. I keep a folder of randomly gathered images and texts for inspiration, which I spent the week sifting through and piecing together into a spiderweb of a story. Connections and sub-stories eventually emerged and became the basis of a narrative of a post climate change hideout that the protagonist is trying to locate 500 years in the future. I named the game ‘Lair of the Neo-Diggers’, a subtle hint towards what activities used to take place in this subterranean space. Having had a tradition of searching out an underground location on every holiday I have been on and every recent birthday I have celebrated I have also amassed my own archive of photographs of cave entrances and tunnels. 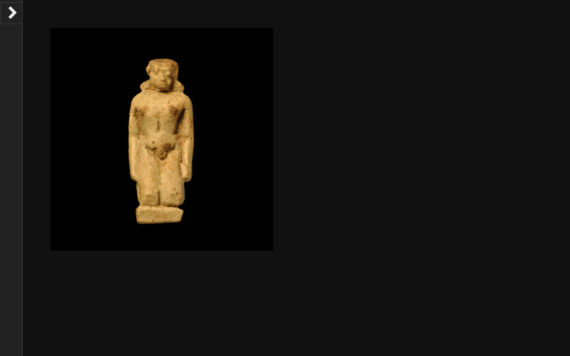 These images became the backbone of the games ‘physical’ structure as it advanced downwards from the starting point of Margate Caves. 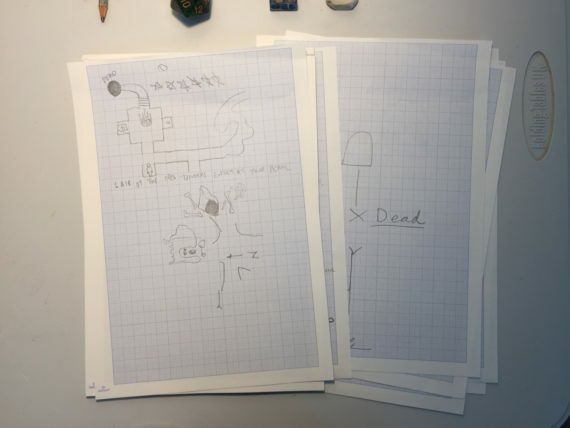 When I exhibited the project, audiences were encouraged to map out where they were going in-game by drawing the space they uncovered. I also played with the physical gallery by using tape to map out corridors and entrance ways on the floor. Those visiting the space could choose to follow these marks as a map, embodying the journey taken in the game. Another idea I hoped would work was that as people uncovered more of the cave in-game they would add their findings to a map which hung on the wall. However, the feedback I got was that people got so engrossed in the text game that they forgot about this element. This response made me wonder whether something simpler, – something which leaves more to the imagination -, like a text-based adventure game, might be more effective in conveying imaginative narratives. I initially thought of the text-based game as a tool to map out the beginnings of a more sophisticated 3D landscape, but now I wondered if a less is more approach might work better altogether. This is an approach I am familiar with from organising Nordic-style Live Action Role Play workshops (with no props or costumes), but the whole idea behind my bursary application was to delve further into the visual aspects of gaming and roleplaying. 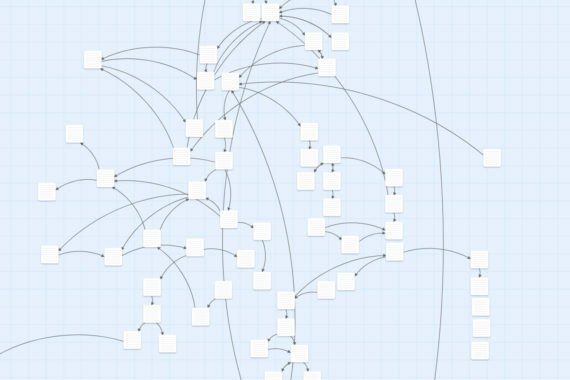 While I’m figuring this all out, I’ve slowly been working on expanding the network of fictional tunnels in the game and getting more sophisticated with using Twine. If you would like to play test the game do get in touch and when the game feels less like a work in progress I will be making it available on my website.